The Italian word pesto translates roughly as “pounded” and typically refers to any food mashed in a mortar. 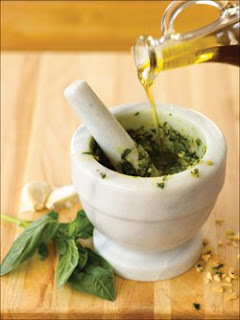 But the best-known pesto is a sauce made with fresh basil leaves, garlic, olive oil, pine nuts, and grated cheese. It is traditionally the sauce for a pasta dish that also includes green beans and potatoes, but here the pasta has been left out and the pesto is instead served over a salad of warm cubed potatoes and green beans. In another departure from tradition, dry-roasted almonds are used in place of the pine nuts. Make this recipe in the summer when the markets are well stocked with beautiful fresh basil. Place the garlic, ½ teaspoon of the salt, and 2 tablespoons of the almonds in a large mortar. Pound with the pestle to a smooth paste. Gradually add the basil leaves while pounding, adding more only after each batch has been reduced to a paste. This will only take 2 to 3 minutes. When all of the basil leaves are pounded to a smooth paste, gradually add both cheeses, stirring with the pestle to blend them with the basil paste. Then drizzle in the olive oil with one hand while stirring and pounding with the pestle in the other hand until the mixture is smooth. Set aside. Fill a 6-quart Dutch oven or other large, wide pan two-thirds full of water and bring to a boil. Add the remaining 1 tablespoon salt and the potatoes. Boil, uncovered, for 10 minutes. Add the green beans and boil for 6 to 8 minutes, until both the beans and potatoes are tender. Drain in a colander. Place the beans and potatoes in a large serving bowl, spoon the pesto on top, and fold together gently with a rubber spatula until blended. Sprinkle with the remaining 2 tablespoons almonds. Garnish the bowl with the tomato wedges. Serve warm or at room temperature.